"Parant and Griswold use only fresh ingredients, so even though TexaFrance products are prepackaged, they taste like they were whipped up on the spot." Our top-drawer condiments, pasta sauces, mustards, pestos, chutneys and jellies are meticulously prepared and packaged by hand. You are assured of high quality products and fresh flavors, ready the moment you need them... "your sous chef on a shelf." 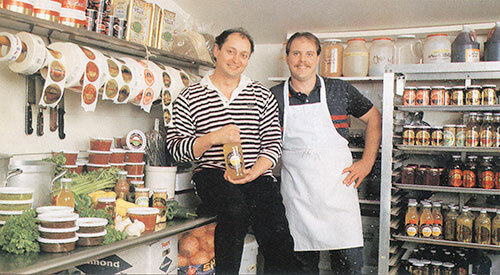 Chefs Jean-Pierre Parant and David Griswold in their Round Rock, TX facility. TexaFrance, Inc. is a privately owned corporation founded in 1986. Today chefs and co-owners David Griswold and Jean-Pierre Parant have more than 50 years combined experience in the hotel, restaurant and food service industries. Over more than 25 years they applied this experience to food manufacturing with the goal of fulfilling a clear demand within a defined niche: Gourmet foods that inspire both amateur and professional chefs with new flavors, choices, quality, and convenience — a kind of "lifestyle authenticity" that is sometimes difficult to attain. TexaFrance, Inc. was created as a niche specialty gourmet food manufacturer and distributor that would bring the original vision to reality. Under this label we produce a line of refrigerated and shelf-stable products. We also prepare and package products for private label clients. Our products are sold in regional retail grocery stores and used in the food service industry across the country. Today we continue to enjoy the steady growth we have experienced over more than 25 years. We are small, flexible, and provide sincere, timely attention to every client's needs and concerns. Quality ingredients and packaging means great products. Our Quality Control program results in consistent products that consumers can rely on. Located just off IH 35 in Round Rock, Texas we are central to metropolitan areas where products are sold and consumed, and convenient for truck loading/unloading. Creating foods for the sophisticated palate of modern consumers is an art. TexaFrance employs a broad palate of flavors and tastes to create products that are unique and in demand. Our facility operates on safety and health procedures that meet or exceed industry standards. "They're constantly developing and perfecting time-saving methods to create dishes more quickly without sacrificing a whit of the flavor and beauty of food."